Gem-Water products by VitaJuwel naturally boost the alkalinity and oxygenation of everyday water in just 7 to 10 minutes. 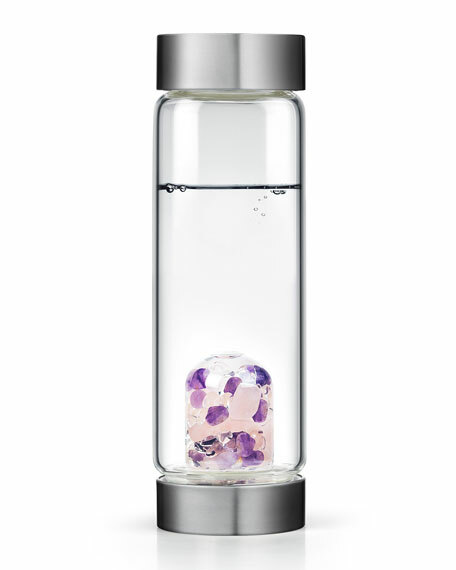 Each vial is hand blown and holds a blend of semiprecious gemstones that naturally vibrate at a frequency that restructures or "wakes up" water boosting its alkalinity (pH) as high as 8.02 and raising its oxygenation. The result is enlivened water with qualities comparable to spring water. The smoother/softer mouth feel makes for a refreshing taste experience and improved hydration for the body. Water bottle of 18/8 food grade stainless steel. Keeps drinks cold for 24 hours and hot for 12. Sweat-free and perfect size. Holds up to 16 oz. 2.87"Dia. x 8"T. Imported. Stainless steel water bottle. Tritan?? clear center. Holds 14.5 ounces. 2.25"Dia. x 9.5"T. Hand wash. Imported. For those who feel like they want a little extra protection for their Gem-Water Bottle. This matte-textured silicone VitaJuwel Loop covers both the top and bottom stainless steel caps of your Gem-Water Bottle. 3.75"Dia. x 2.75"T. Silicone; hand wash. Imported.